Greg Balestrero, Former President and CEO of Project Management Institute (PMI®) Joins International Institute for Learning, Inc.
International Institute for Learning, Inc. (IIL) is pleased to announce that Greg Balestrero, former President and CEO of Project Management Institute (PMI®) has joined IIL. In a career spanning nearly 40 years, Greg has been a passionate proponent of excellence in the pursuit of business results. He has met with business and government leaders in more than 60 countries, advocating and promoting a project focus in engineering, construction and a broad range of business sectors. This exposure has shaped his thinking and message, reinforcing the need that organizations must transform to sustain themselves, integrating the values of community and the planet, with their own corporate strategies and values. At IIL, Greg will give strategic input to the development team that creates new programming relevant to Corporate Consciousness, Leadership and Sustainability. In addition to supporting IIL initiatives already underway in leadership development, he will also utilize IIL Media, a new division of the corporation, to spread the word about the need for corporations to look at their portfolios of products and services in a new and powerful way. He will help global corporations discover how they can change their strategies to focus on serving their communities and the entire world, while being or becoming market leaders. A book is forthcoming by Mr. Balestrero on this subject, the goal of which is to spur on a massive change in business purpose and practices across all industries. Founder, President and CEO of IIL E. LaVerne Johnson said of Greg's joining IIL: "All of us at IIL celebrate Greg’s arrival. In addition to being a project management champion, he is a key influencer in the field and a pioneering and visionary leader. My personal values - and those of IIL - are very much aligned with those of Corporate Consciousness and Sustainability. We are very fortunate to have Greg as part of the IIL global team!" Mr. Balestrero spoke of this opportunity with enthusiasm: "The decision to work at IIL is one of the most significant and important of my career. I feel like I have found a home and a kindred spirit in bringing organizations closer to positive change in the world! From the very first time I shared my passion about the need for corporate change in 2005, LaVerne Johnson made it quite clear that she believed in the mission of altering the consciousness of corporations, to making them accountable for their impact on the planet and on society. I know I am joining an entire team of professionals committed to making this a reality." A featured speaker at regional, national and international events, Mr. Balestrero has been quoted and referenced throughout his career in a variety of media, including USA Today, Forbes Magazine, Financial Times, and The Wall Street Journal. He has also appeared as a guest on news and business radio and television, including CNBC, BBC World, Sky News and China National TV. 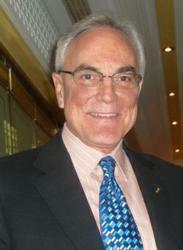 Greg retired from PMI in 2011, after serving more than 8 years as its President and CEO. During his tenure, the organization experienced unprecedented growth, expansion and maturity. Under his leadership, PMI membership nearly quadrupled to over 340,000 in 180 countries, and holders of the PMP® project management credential increased from 50,000 to nearly 450,000. Strategic Advisor to the board of ASQ, Greg also serves on the Advisory Group of the National Ignition Facility (NIF) at Lawrence Livermore Laboratories and on the Advisory Board of Interel Corporation, in Brussels, Belgium. He is a special advisor to the Board of the Pediatric Brain Tumor Foundation (PBTF) in Asheville, NC as well as a voting member of the Board of the Human Resource Certification Institute (HRCI). Mr. Balestrero was honored with a fellowship in the World Academy of Productivity Scientists and was made an honorary member of Alpha Pi Mu, the industrial engineering honor society. In addition, Greg received the prestigious FRIENDSHIP AWARD, on behalf of PMI, from the State Administration of Foreign Expert Affairs (SAFEA) of the government of the People's Republic of China (PRC). He earned a Bachelor's Degree in industrial engineering from the Georgia Institute of Technology in Atlanta, Georgia, and he is a U. S. Army veteran. He shares his life with Frances Higgins, his wife of 34 years. His personal passions include jazz music, sailing, motorcycling and having fun with his and Frances' two dogs, Jazz and Oscar. With operating companies all over the world and clients in more than 150 countries, IIL is a global leader in training, consulting, coaching and customized course development. IIL's core competencies include: Project, Program and Portfolio Management; Business Analysis; Microsoft® Project and Project Server; Lean Six Sigma; PRINCE2®; ITIL®; Leadership and Interpersonal Skills. Using their proprietary Many Methods of Learning™, IIL delivers innovative, effective and consistent training solutions through a variety of learning approaches including: Virtual Classroom, Traditional Classroom, On-Demand Learning and Simulation. Now in its twenty-first year of doing business, IIL is proud to be the learning solution provider of choice for many top global companies. For more information, visit http://www.iil.com or browse IIL's Digital Learning Catalogue. Headed up by Emmy Award-winning Director/Producer d.b. Roderick, IIL Media develops and produces innovative videos that educate, train, engage and entertain. A full service digital video production company, IIL Media also collaborates with outside clients to create and develop cutting-edge videos. IIL Media's unique cinematic style of visual storytelling adds creativity, depth and dimension to corporate and instructional videos, webinars, interviews and event coverage. IIL Publishing produces a wide range of quality books and educational resources targeted to global business professionals. The company is proud to hand-select authors whose subject matter expertise is complemented by their status as key influencers in their field. Passionate about the books that it crafts, markets and sells, IIL Publishing focuses on topics ranging from Project Management to The Power of Acknowledgment®; from Leadership to Lean Six Sigma; and from Business Analysis to Best Practices in Scheduling and Planning.